So many breakables! Savta Rabah's house. Our road trip to and from Long Island over the weekend went relatively smoothly, except for one minor thing. Three hours into our drive and five minutes before we arrived at the hotel at 10:45PM, Alice's eyes popped open and she was wide awake. And having just taken a two-and-a-half hour "nap", there was no way she was going back to sleep anytime soon. So we checked in, got to our room and tried putting her to bed again. We kept the lights low. Put on her noise machine. Laid down on the other bed and pretended to sleep. But nope, she wasn't catching our drift. She just kept rolling around on the bed, playing with her Guy and quietly talking to herself. If we would've brought her travel crib, then no problem. She could've rolled around and talked to herself all night. But she was on the second bed in the hotel room and I didn't feel comfortable going to sleep until she did. So I climbed into bed with her in hopes that seeing Mommy sleep would help her to fall asleep as well. The idea of sleeping with Alice seems so sweet and yes, for short durations like naps, it really is one my favorite things to do. But an entire night of elbows and hands and feet assaulting my face and nudging my body aren't at all conducive to a restful night's sleep. But I persevered and I think we both fell asleep somewhere around 2AM. Only to be awoken four hours later by those same little hands and elbows. But despite our lack of sleep, it was wonderful to see my grandparents one last time while we live on this coast. 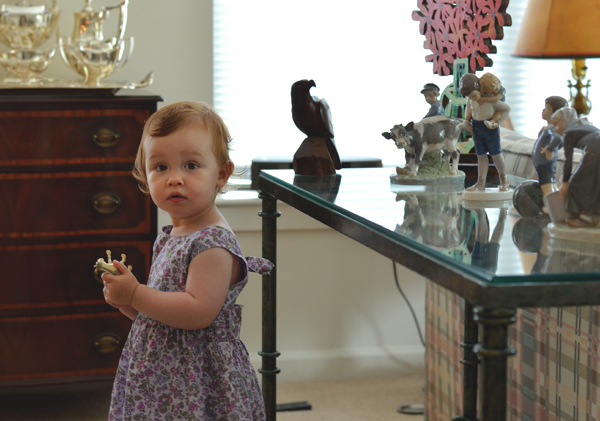 And Alice loved running around their home, admiring all the many figurines while Lee and I tried to keep her from breaking everything. And then, right on cue, during the drive home and five minutes before we arrived at our apartment, Alice's little eyes popped open and it was party time all over again. It seems as though she's found a way to make even nighttime road trips more difficult for her parents. Thanks for that, kid. Any tips for getting a kid out of the car seat and into bed without waking them? Even though Alice took care of this for us, I did spend a lot of the drive wondering how I was going to keep her asleep while schlepping her through the hotel to our room. Quick! Nobody look at the camera! I have never been able to transfer Nolan. I have found that some kids sleep like they are dead, and some just dont! Generally if he car sleeps, whenever we get to our destination, he is up for awhile. It was wonderful to see Savta and Zayde. I'm glad Alice behaved. Savta was telling everyone how talkative Alice was, repeating lots of words and how intelligent she is. 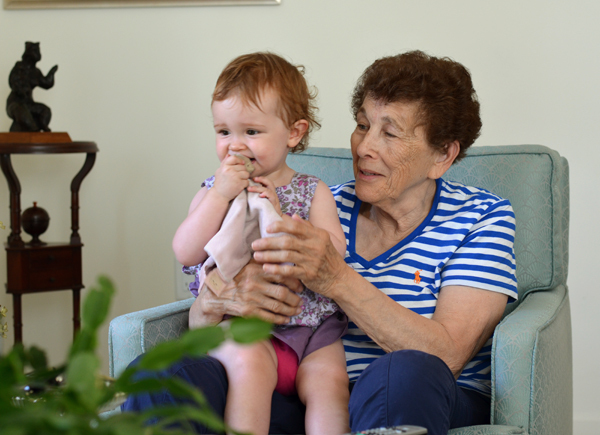 She is a very proud great grandmother.